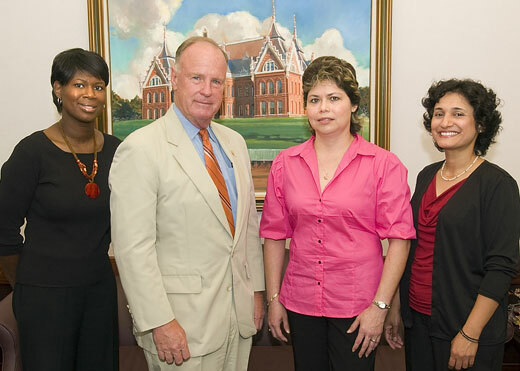 Pictured with SHSU President Jim Gaertner are the Staff Excellence Award winners for 2008. They are, from left, Debra McCall, Reyna Ayala and Elfreda D'Cunha. Reyna Ayala, Elfreda D’Cunha and Debra McCall have been selected as the recipients of the 2008 Staff Excellence Award for their outstanding work at Sam Houston State University. Each recipient will be awarded $2,000 and will be recognized at the university’s general faculty and staff meeting at the beginning of the fall semester. 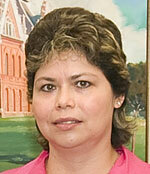 Ayala is a custodian in the Lowman Student Center. “When students are lost or just don’t know where to go, she takes time to walk them over to where they need to be,” said groundskeeper Ernest Wilson. “She is very particular about doing an excellent job. She sets very high standards for herself and lives up to them,” said custodian Carrie Wanza. “She always has her work completed before deadlines or before an event is scheduled,” said custodian Blanca Alvarez. D’Cunha is a registrar assistant II in the Office of the Registrar. “Our office has received numerous cards, letters and phone calls about how pleased they are with the customer service they received from Elfreda and how they feel so assured after talking with her,” said assistant registrar Valerie Sparkman. “Elfreda’s direct duties are to keep the National Student Clearinghouse reports submitted on a regular basis and to update student records daily with the NSC,” said assistant registrar Maria Busby. 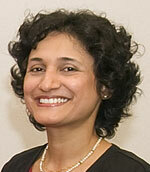 “She also serves our alumni with requests for duplicate diplomas and degree research as needed. She often helps students with their employment verifications by providing potential employers the needed information. McCall is the assistant to the dean of the College of Criminal Justice. “Debra assists students at various levels – from undergraduate to doctoral, from those who have full scholarships to those with special needs,” said Doris Powell-Pratt, staff associate II. “She treats everyone the same. She gets results and comes up with solutions to problems. 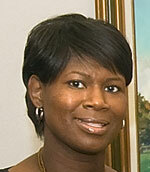 “She is well-respected and liked by faculty and staff all over campus,” Powell-Pratt added.